A friend of mine had a great backpacking adventure walking through the John Muir Trail, a trail that’s more than 200 miles’ long, stretching from the Yosemite National Park all the way south to Mt. Whitney in southern California. I thought, that was really cool! I’ve never had a big adventure like that. Growing up in a family that’s not super enthusiastic about outdoor activities, and in locations where activities like camping or backpacking are not popular, I found this adventure really fascinating. I wanted to do something like that! But I had never done camping or backpacking. I only Hiked a few miles during daytime. My friend said to me, hiking and backpacking, especially long-distance backpacking are very different, I would need to prepare for that. So I made a goal that this year, I wanted to do long-distance backpacking. My target is to backpack 170 miles on the Lake Tahoe Rim Trail. Ok, I admit that I was a total newbie. I needed to start from zero, preparing towards that big goal. A few friends of mine just bought backpacks, tents, sleeping bags and went straight backpacking, for their first-time experiences. Maybe I’m more cautious, but I’d like to have some basic knowledge before going onto a big trip. 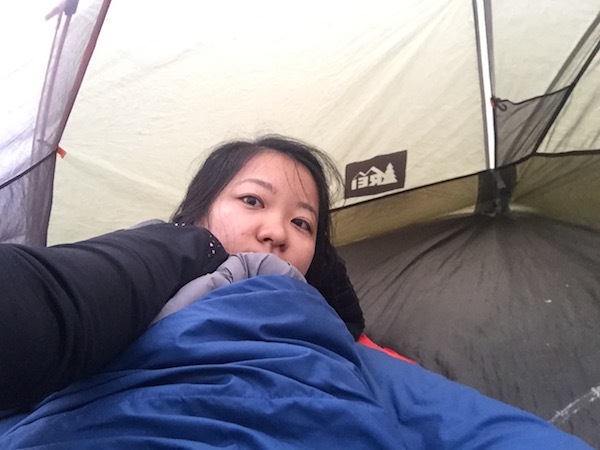 Therefore, I decided to start small — from one night camping to short backpacking trips — so that I know better on how fast I walk with a backpack, and how I like sleeping out in the wild. I joined a few online forums and Facebook Groups, just to see what topics “real backpackers” care about and what questions they ask — I was so new that I didn’t even know where to start, let alone asking questions. I also borrow a bunch of books to quick browse and absorb knowledge from experts. You may think I’m an old school bookworm who tries to find solutions from books. Well, compared to articles on scattered topics here and there, books are collections of the essentials from backpacking experts, from how to select gears, to learn about ticks and lyme disease, to where to safely store food, all the way to how to treat blisters. I think they are wonderful. 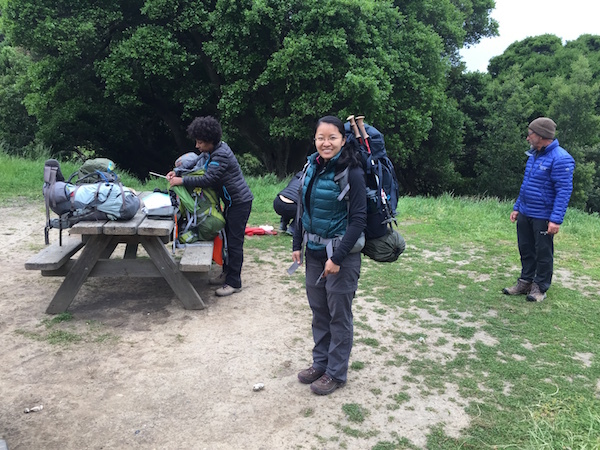 For this class, REI provided all the basics: tents, sleeping bags, sleeping pads, backpacking, stoves, some of the meals. That was wonderful, because I had no gears. 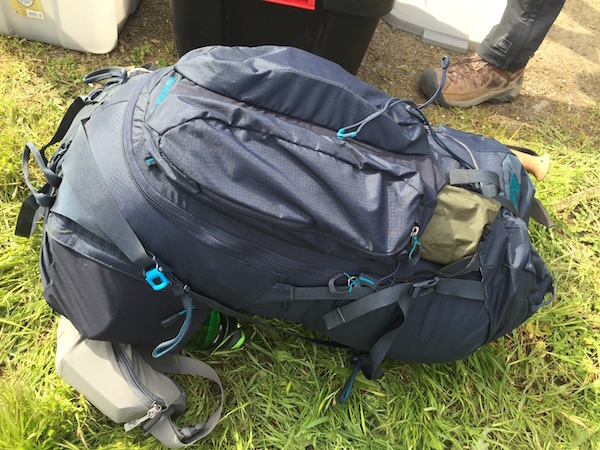 I only needed to bring some personal items, such as waterproof clothes and pants, layers of clothes, water bottle, sunscreen, sunglasses, hat, bowl and snacks. The night before the class, I put all of them together into a handbag and waiting for tomorrow to come. Headed to my REI Overnight Backpacking Class! On the day of the class, I got up early and fed myself, then left for where we would meet. I parked my car and noticed two instructors, Ely and Phil, were there waiting already. Gears and items were on the ground for us to pick later. After all students arrived, Ely started showing us around, explaining what each gear was for. I was busy taking pictures of the items, so that I can use them for my own future reference. After that, we each needed to pick our own gear. I looked at the backpacks and felt like a fool — I had no idea how to pick one that worked for me. Ely roughly measured the length of my torso and found one for me. After that, I got my own sleeping bag, tent and other items, and stuffed them all into this backpack. 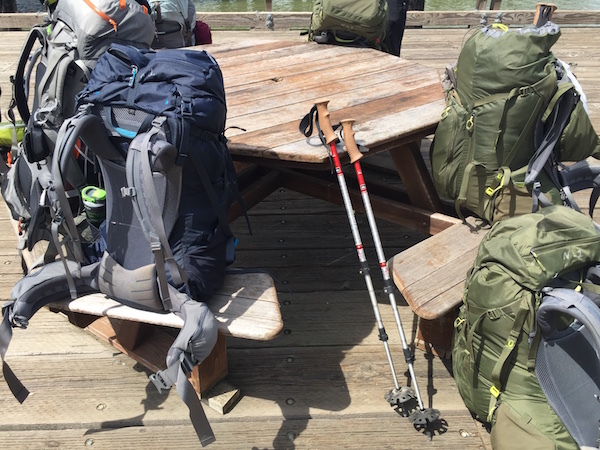 A backpacking backpack is very different from the ones I have for school or work, which put all the weight on my shoulders. The most significant difference is the thick waist wrap. Normally, backpackers carry 25-30lb in their backpacks. If all that weight is on the shoulders, then you’re set to injure your shoulders. Backpackers have most of the weight on the waist, and minimal on the shoulders. That’s what the waist wrap is for. In your backpack, put the lightest item below waist, such as a sleeping bag (1-2 lbs). Put the heaviest items close to your back (above waist), such as a full water bladder. And around medium weight, such as a tent and a stove. 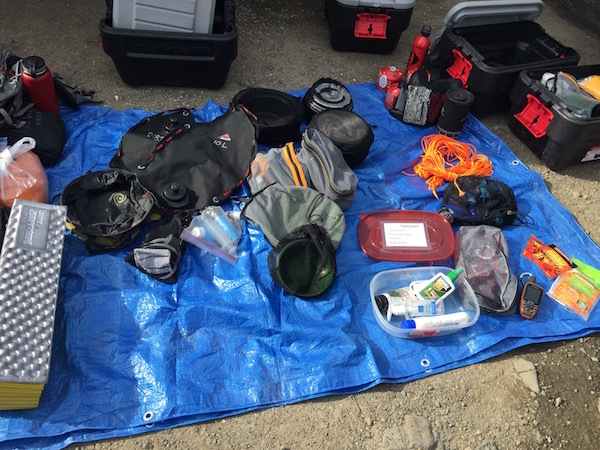 Put items you need to have easy access on the outside or the top bag, such as a rain jacket, headlamp and snacks. My first backpack ever, about 25-20 lbs. The backpack is pretty heavy, and if you don’t want to hurt your back, do not swing it onto your back. Instead, first put it onto your thigh, then shift it onto the back. If there are tables and other objects with a good height, put your backpack there, then shift onto your back. 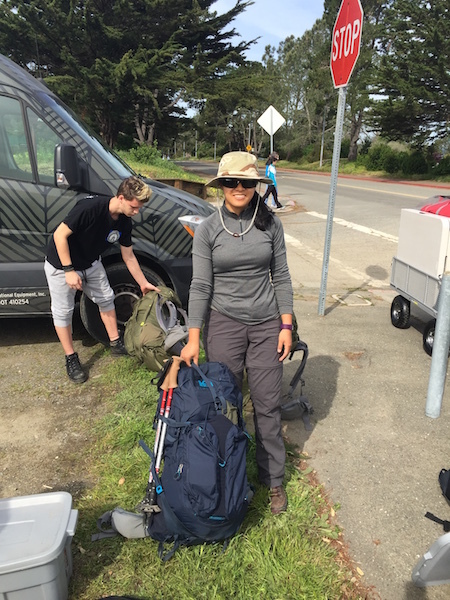 Angel Island State Park… We are here! The destination of our group was on the beautiful Angel Island State Park, the second largest island in the San Francisco Bay Area. To get there, you need to take a ferry (Google “Angel Island Ferry”). For our class, we rented a private boat — so great that we didn’t need to compete space with the crowds. After we landed on the island, a ranger gave us a couple of maps, roughly talked about plants and animals, as well as emergency contacts. She specifically touched on food storage at night. Raccoons are very active on the island and not afraid of people. They are likely to come to the campsite to find everything that smells like food, such as toothpaste and sunscreen. They all need to be put away into the food locker. Their noses are so much more powerful than ours, and can smell things we humans are not aware of. So be mindful. We found a table by the dock, and learned a few basics for map and compass use. After that, we all went to the restrooms and filled our water bottles, put backpacks on and off we went. We hiked a bit, and sat down for sandwiches off trail, and set off again. Most of us were beginners with no experiences, so we had a pretty good and steady (but not fast) walking speed. It took us about 4 hours to hike up Mt Livermore and down to the campsite. We reserved a group campsite called KAYK. It was very big, flat and with a view across the water of Tiburon. There were a few picnic tables, trash bin with locks, a food locker and a BBQ grill. First thing we did after getting to the campsite was to pick a site to pitch our tents. If you don’t do that right then, you will be too tired to do it later and find it’s too dark around. We each found a spot that we liked. I found a quarter coin on the grass — a lucky quarter, soooooo lucky! You’ll find instructions on how to pitch your tent on the sacks. Remember to pitch the tent firmly onto the ground, so that wind doesn’t shake it too much. If you’d like to pitch your tent on a slope, always put your head on the upside of the slope, or you may have a terrible night, with all the blood going to your head. The sun started to go down after we finished our tent setting. Time for dinner. 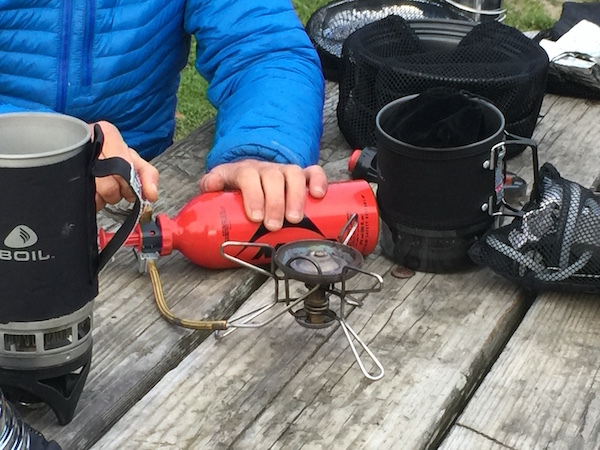 Ely and Phil brought different stoves for us to try, using liquid fuel and fuel canisters. 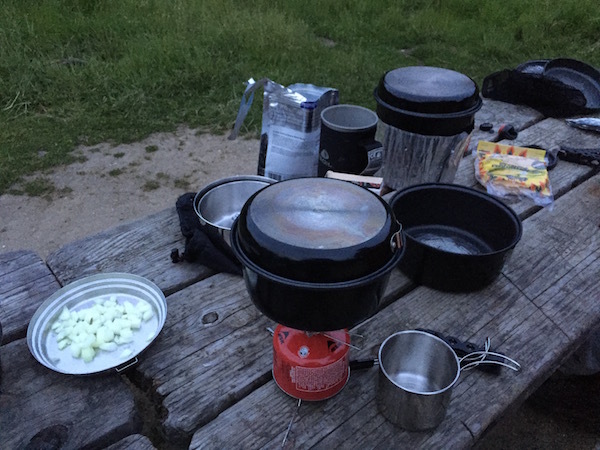 Meals at campsite can be dead simple — you just pour boiling water into dehydrated food, stir and eat. It can be luxurious — DIY your own receipt full of nutrition and flavors, dehydrate them, heat them up with water at the campsite. 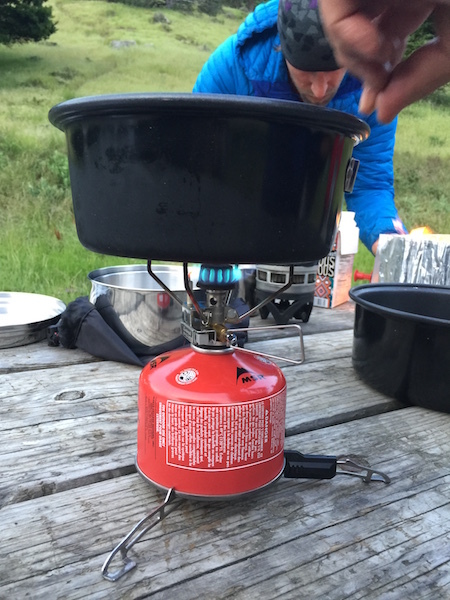 Fresh foods are hard to store for long-distance backpacking trip, therefore dehydrated food are popular. Our instructor Ely brought a fresh onion, chopped it to let us make tacos. I thought this was some luxury! After dinner, we cleaned all the cooking pans and utensils. “Raccoons will be really disappointed.” I thought. We sat down for another while, listening to Ely and Phil talking about their backpacking stories, until it was completed dark. We said goodbye to each other and went straight to the cozy sleeping bags inside tents. 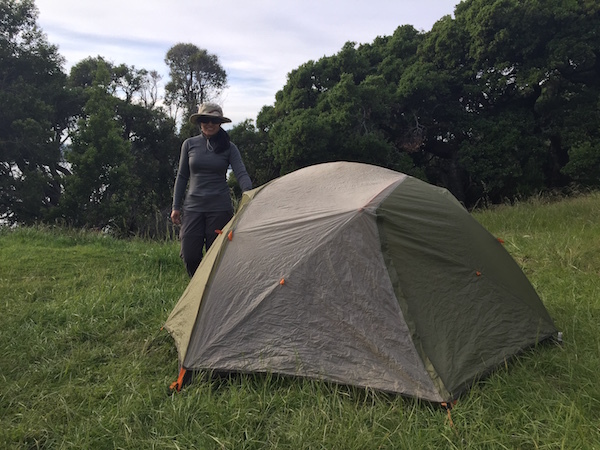 Perhaps it was because I was a bit nervous about sleeping in the wild for the first time, or because I didn’t make the tent firmly enough stand on the ground, I woke up quite a few times, thinking I heard some sound. But I was able to get back to sleep quickly. I woke up a few minutes after six, hearing birds chirping outside. I made a deep breath, letting the fresh smell of grass fill my lungs. I stuck in my warm sleeping bags for a few more moments, and got out of my tent. Looked like that all of us had a pretty good sleep that night. “Come here, you all,” Phil called us, pointing to a backpack lying on the grass, with a few items scattered around. “Did you hear anything?” I asked. “No, I slept like a stone. I heard nothing.” Said Phil. Oh thank goodness, I put my backpack inside the tent. 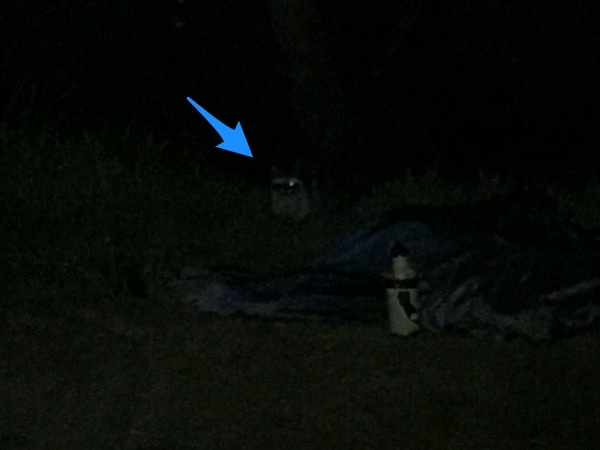 I didn’t have my raccoon neighbors dropping by because I didn’t leave any smelly things in my backpack. I will pay attention to this in future camping for sure. We finished our breakfast, put everything back into our backpacks. It was right at that moment, the rain dropped — what good timing! We had just time to put on raincoat, and rain cover onto our backpacks before more rain hit us. We looked around and made sure nothing left for the campsite, and continued our trip back to the dock. An overnight backpacking trip was too short to enjoy all the fun. Only experiencing it myself can I get rid of the fear of sleeping outside. Great adventures have just begun.